So, you’ve decided you want to buy a bike – great! Cycling is one of the most accessible and rewarding things you can do, whether you want to get fit, lose weight, or just get around. Choosing the right bike can be a minefield though, with an increasingly vast range of bikes available all designed for different purposes. But fear not, we’re here to help and in the guide below you’ll find all you need to know to help choose the right bike for you. Firstly, it’s important to think about what you plan to do with your new bike and where you’re going to ride it, as this will have the biggest impact on the type of bike that suits you best. Will you just be sticking to the roads, or will you be heading off-road more often than not? Are you planning long rides into the countryside, or just need something to get to work on? However you answer these questions, there will almost certainly be a bike that will serve you proud. Road bikes, as you might expect, are designed for riding on surfaced roads. Characterised by skinny tyres, lightweight frames and dropped handlebars, road bikes encourage you to travel fast and eat up the miles. With a huge surge in popularity in recent years, you can now pick up a road bike to meet almost any budget, all the way up to the carbon fibre superbikes that you’ll see in the Tour de France. With the ability to cover ground quickly, road bikes can also lend themselves well to commuting. With their aggressive riding position some people might struggle to get comfortable on a road bike, and they can be less resilient to knocks and potholes than their beefier off-road siblings. If you need to carry a lot of luggage on your bike it’s also worth bearing in mind that not all road bikes will have the required mounts. Mountain bikes are designed for charging round woods and trails – basically everything that road bikes aren’t! As such, they have a number of design features that make them better suited to this terrain such as larger knobbly tyres for better grip and powerful disc-brakes to help you stop more effectively on uneven terrain. Depending on your preferred riding and budget you’ll likely go for either a front suspension hardtail bike or a full-suspension bike with front and rear suspension which provide better control off-road. Mountain bikes can be great all-rounders too, with a more upright position and wide gearing range. On the downside, however, mountain bikes are usually heavier than road bikes and the suspension can be inefficient when riding on smoother roads. The knobbly tyres will slow you down if you plan to do a lot of riding on tarmac as well. Hybrid bikes are the great all-rounder of the cycling world, combining the very best of road and mountain bike style and technology to give you the perfect mix of reliability and ride-ability – fast when you need it to be, but tough enough to cope with bumps and potholes. The do-it-all design of a hybrid bike includes wide, straight handlebars and an upright sitting position for comfort and stability, with sturdy frame and mid-sized tyres. If you’re not sure just what kind of riding you’ll be doing, hybrid bikes are the perfect choice because they combine the best elements of performance, comfort and durability. Best for: Rough roads, limited off-road riding, and getting muddy! 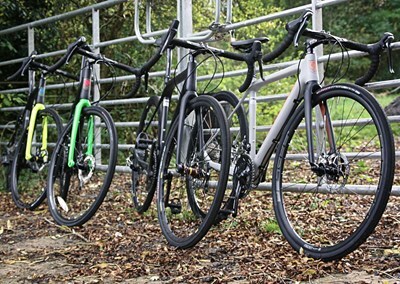 Sitting somewhere between road bikes, touring bikes and mountain bikes, cyclocross & gravel bikes – or ‘adventure’ bikes, for some manufacturers – are essentially more capable road bikes, with drop handlebars but chunkier tyres and wider clearances to allow better handling on rough roads and trails. These bikes can be a great choice if you like the speed of a road bike but want something more capable, as many will also come with rack mounts and mudguards fitments, and with the better braking provided by disc brakes. Geometry is usually more relaxed than a road bike, but you can still find out-and-out cyclocross race bikes which will all be about speed. Touring bikes are designed to carry you – and all of your stuff – across continents and beyond. With 700c wheels, touring bikes allow for good rolling speed but with wider tyres to tackle different terrains in comfort. With a relaxed riding position and all the fittings required to carry luggage, touring bikes are a reliable all-rounder, although not as quick as a road bike. Folding bikes are an engineering marvel, and a convenient and practical alternative to the traditional bicycle. Best suited to short rides, you can ride to the station, fold your bike up, jump off at the other end, ride into the office, and stash your bike under your desk for the day. As you might expect, folding bikes are popular in big cities and due to their design they won’t ride quite as well as a conventional bike. When it comes to choosing a folding bike there is really only one brand to consider – the Brompton. We’re huge fans of electric bikes here at Rutland Cycling, and they’re becoming increasingly popular for both experienced riders and those new to the sport. The beauty of an electric bike is that first and foremost they are simply great bikes – but with the extra assistance of an electric motor to help you pedal. That means you can ride further than you might have been able to before, go out more often as you’ll have used less energy, get up hills that might have bought you to a halt before, or get an extra loop in at a trail centre before heading home. With electric road bikes, electric mountain bikes, and electric hybrid bikes all available, there will almost certainly be something electric to suit you. If you’re looking for a female specific bike, you’re spoilt for choice these days! All of the biggest brands now have dedicated women’s ranges which are better suited to women’s body types, whether you want a road bike, mountain bike or ‘cross bike. Still not sure which bike is for you? Our store teams have extensive knowledge and will be able to guide you through the bike buying process from start to finish, or you can contact our Customer Services team on 0330 555 0080, oy by email. Home Latest News & Updates at Rutland Cycling What bike should I buy?